I am back after a couple years of illness. When I first set up this blog and posted an article with chocolate cosmos in it, I have received many requests for information on where to buy them. 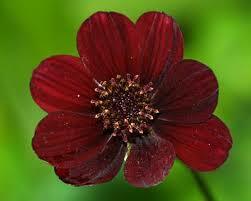 Cosmos atrosanguineus (Chocolate Cosmos) is a species of Cosmos, native to Mexico, where it is extinct in the wild. The species was introduced into cultivation in 1902, where it survives as a single clone reproduced byvegetative propagation. It is a herbaceous perennial plant growing to 40-60 cm tall, with a fleshy tuberous root. The leaves are 7-15 cm long, pinnate, with leaflets 2-5 cm long. The flowers are produced in a capitulum 3-4.5 cm diameter, dark red to maroon-dark brown, with a ring of six to ten (usually eight) broad ray florets and a center of disc florets; they have a light vanillin fragrance (like many chocolates), which becomes more noticeable as the summer day wears on. BTW, I still have yet to see these in any garden shop. It is a shame too, as I imagine they would be quickly snapped up by we flower gardeners. How would you like to own a universe? This will probably never happen but you can grow a plant which produces “showy flowers” in an “orderly arrangement of cosmic proportions”. 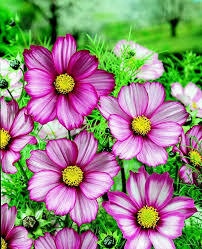 Cosmos is the flower you should grow. Spanish priests grew cosmos in their mission gardens in Mexico. The evenly placed petals led them to christen the flower “Cosmos,” the Greek word for harmony or ordered universe. Cosmos, like many of our warm weather annuals such as marigolds, originated in Mexico and South America. Cosmos belongs to that vast family of plants known as Compositae. 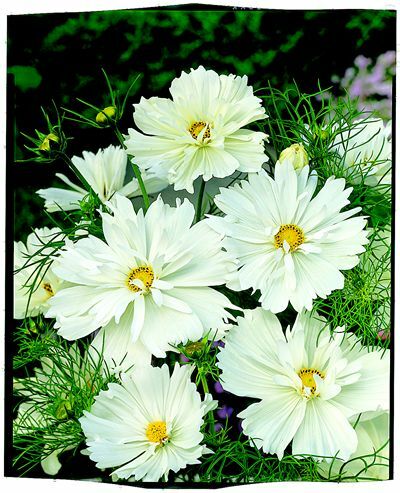 Although there are 20 known species of cosmos, two annual species, Cosmos sulphureus and Cosmos bipinnatus, are most familiar to home gardeners. These two species are most easily differentiated by leaf structure and flower color. The leaves of C. sulphureus are long, with narrow lobes and hairy margins. The flower colors of this species are always shades of yellow, orange or red. The C. bipinnatus has leaves that are finely cut into threadlike segments. The foliage looks similar to ferns. The flowers are white or various shades of pink to dark rose. Cosmos sulphureus (Yellow Cosmos) – the species native to the Americas – is my favorite and the one I recommend you try if you have never grown cosmos.. Plants of yellow cosmos can range in height from 4 to 7 feet but the cultivated varieties such as ‘Crest Red’, ‘Ladybird Dwarf Red’, ‘Ladybird Dwarf Gold’, ‘Ladybird Dwarf Orange’, ‘Ladybird Dwarf Lemon’, and Yellow Cosmos – Klondyke Mix are not as tall. The flower heads are composed of disc and ray flowers. The disc, or center flowers are yellow: the ray, or outer petals range from pale yellow or mustard to orange-scarlet. Red is a relatively recent addition to the color range of C. sulphureus. The native species is golden-yellow to orange. Rich, fertile soils tend to produce unusually tall, lanky plants. Yellow cosmos requires full sun. Sow seed of C. sulphureus in early spring since seedlings are not winter hardy. The average planting success with this species is 80 percent. The plant height is 2 – 4 feet depending on culture and variety selected. Plants will germinate in 7 – 21 days when the soil temperature is optimum for germination at 70 – 80 degrees F. Plant seed 1/16 inch deep by raking into the soil. C. sulphureus plants bloom from May – November. Plants should be sheared every 30 days or whenever seed pods predominate. Large areas can be seeded at a rate of 15 pounds per acre C. sulphureus plants bloom approximately 50 – 55 days after germination. 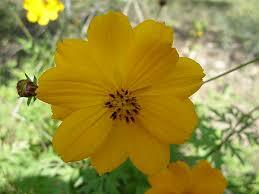 Yellow cosmos needs to be replanted each spring for continued success. Yellow cosmos is easy to start from seed. Rich, fertile conditions are not necessary to grow yellow cosmos, but adequate drainage is. The seeds may be sown outdoors after all danger of frost is past and the soil has warmed to at least 65 degrees F. Scatter the seeds right where the yellow cosmos are to be displayed. Firm or rake seeds into a loose soil — if the seed is planted too deep, germination can be affected. Keep the soil moist for 5 – 10 days after seeding. Seeds will germinate in 7 – 21 days. If the early spring has been cold, soil temperatures will remain cool also. If the soil temperature is below 65 F., seeds may not germinate as rapidly. Thinning is really not necessary. 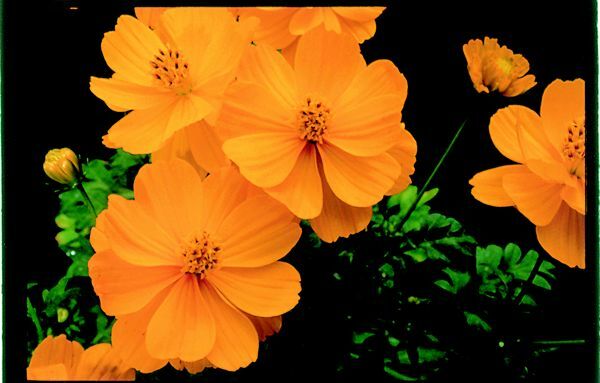 Yellow cosmos needs only basic care to provide a colorful abundance of blooms all summer long. After the seedlings emerge, water VERY SPARINGLY. In lieu of any rainfall during an entire month, give the planting bed a long, slow drink. 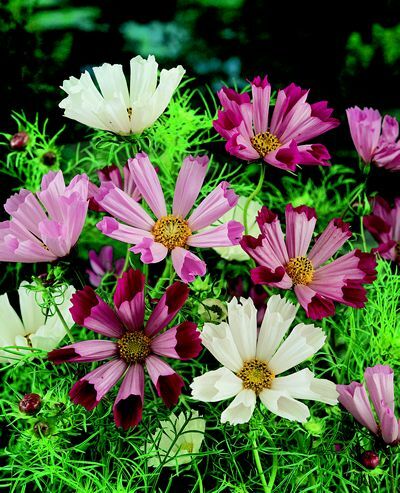 Cosmos is drought tolerant, providing abundant blooms with less water than most other annuals. Herein lies the “problem” which many people encounter when growing cosmos — they “over-care” for their cosmos plants. “Over-care” means too much water, too much fertility and too much shade. When “over-care” occurs, cosmos becomes tall and spindly (even when the new, lower-growing varieties are used), and blooms sparsely. 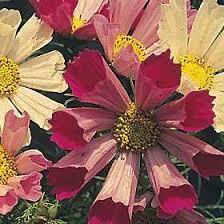 John Thomas says that the best growers of cosmos practice “tough-love” plant culture. “Tough-love” watering means only watering when the cosmos foliage begins to wilt. “Tough-love” fertility means very little if any soil fertility. “Tough-love” location means no shade and in direct, all-day blazing sunlight. Cosmos grows best in the worst conditions Texas has to offer — hot and dry. This is why cosmos is the best possible annual for Texas. When not exposed to “tough-love” growing conditions, this otherwise beautiful flowering plant becomes tall, spindly and sparsely floriferious. 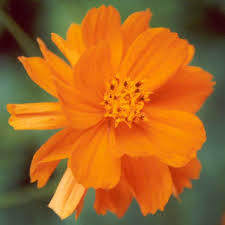 Cosmos sulphureus (Yellow Cosmos) is not as sensitive as Cosmos bipinnatus to pampering and “over-care”. However, if you can discipline yourself to do some “tough-love” growing of Cosmos bipinnatus, you can produce the lovely pastels which the ladies really like. Gardeners also have the added advantage of the naturally smaller growing Cosmos bipinnatus varieties such as ‘Gloria’ pink, ‘Tetra Versailles’ red, ‘Candy Stripe’ white with red veins, ‘Day Dream’ white with red halo around yellow stamens, ‘Picotee’ white petals with red margins, ‘Sea Shells’, ‘Dwarf Sensation Mix’ and ‘Psycho White’. 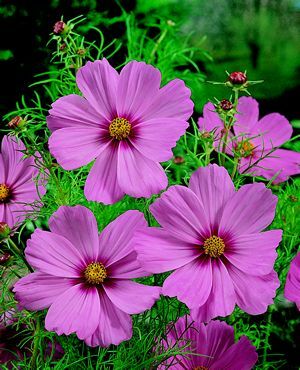 Because cosmos is so easy to grow in the worse conditions spring and summer have to offer, it can be seeded in the spring for early summer bloom or in mid-summer (June) for late summer (August) – until- frost bloom as well. 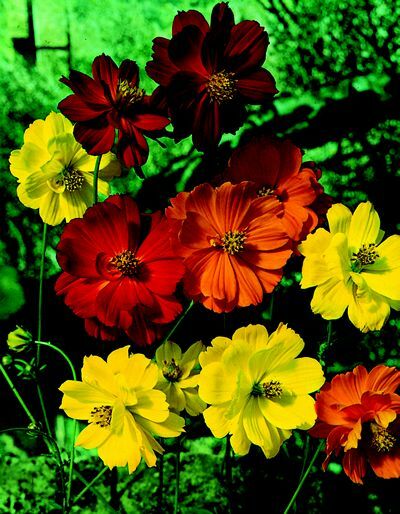 Since cosmos seed actually sprout faster in hot soils and the plant grows best in hot, dry summer temperatures, you can increase your plant population and bloom display by cutting back spring-planted cosmos. When the spring-planted cosmos begins to look as if there are an abundance of dried seed pods, do not remove the plants — encourage re-bloom simply by cutting the plants back to 12 – 18 inches high. They will be back in bloom in a month and the seed cut off will fall to the ground, germinate in the hot soil and increase the density of your plant population and subsequently, the eventual bloom display. 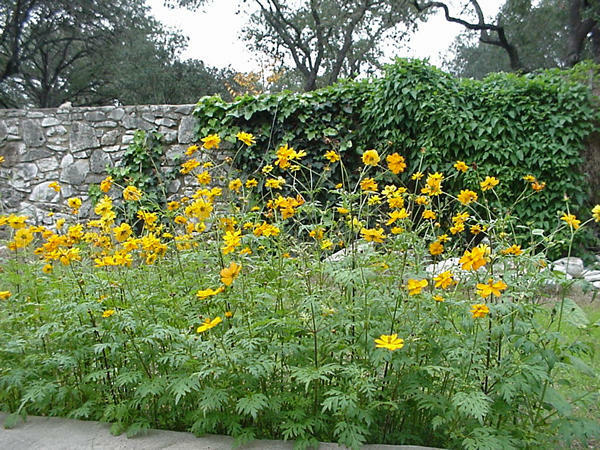 #10 — Cosmos is one of the easiest-to-grow flowers in Texas and is generally a pest-free annual. Freshly cut cosmos blooms make a bright airy bouquet. 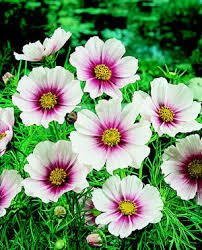 An arrangement of cosmos can last for 7 – 10 days. Select flowers whose petals have just unfolded; they will open fully once cut. Cut the flowers in the morning when their water content is highest and immediately place them in a deep container of tepid water. Before arranging, strip foliage from the lower portion of the stems. If leaves are submerged under water, they will decay quickly, shortening the life of the bouquet. Mid-sized varieties add an airy note when interplanted with evergreen shrubs. Edge a garden path or driveway with medium height cosmos in pastel or bright hues. Because they bloom so freely all summer and into early fall, cosmos is recommended for these highly visible areas. AND, THE NUMBER 1 REASON everyone should grow cosmos is — Growing cosmos is as close as any of us will ever come to actually causing a “cosmic event” but it will be easy for ANY of us to produce showy flowers in an orderly arrangement of cosmic proportions. Bunches of daisy-like flowers and graceful feathery foliage make them a delight in both color and texture. Attactive to birds and butterflies, they are available in two species. Cosmos bipinnatus come in pink, rose, red, white, lavender and bicolors, and Cosmos sulfureus in yellow, orange and scarlet orange. Some varieties of this fast-grower have semi-double flowers, rolled quilled petals or bicolor striped colors. Use 3- to 6-foot tall plants as background, or in wild or naturalistic gardens. Dwarf forms, 1 to 2 feet tall, are good for containers. Excellent cut flowers. Considered drought resistant, Cosmos grows best in full sun, but will grow well and flower earlier in poor, fairly dry soils. Easy to grow from seed, they seed themselves. Do not over-fertilize, unless you want lush plants with few flowers. Tall varieties require stalking. Nearly pest-free, but watch for borers or fungal diseases. Height: 3 ft. to 4 ft. It not only is super packed with information on all types of plants, shrubs and trees, but also has a discussion forum. Wonderful site! Notes: Cut Flowers, Long Blooming, Showy Flowers. Susceptible to Aphids, Beetles, Powdery Mildew, Root Rot, Spider Mites. 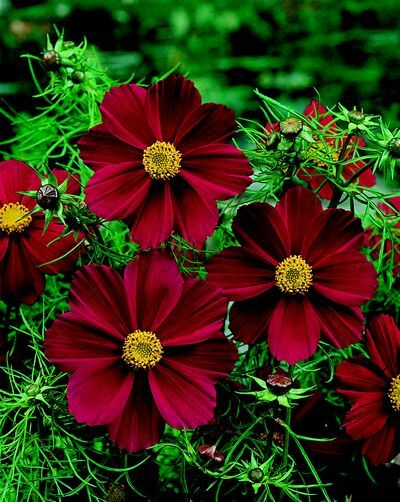 Chocolate cosmos (Cosmos atrosanguinea) is both nose and eye candy for your garden. When it’s in full bloom, mature blossoms on long, slender stems look like candy kisses on a stick and fill the late afternoon with the sweet scent of vanilla tinged chocolate. New blossoms hug the foliage of the plant, nearly concealing it with their numbers! Add to that the sweet chocolate fragrance and you end up with something very special. Although chocolate cosmos is endangered in the wild, transplants are easily found at most nurseries and garden centers in the spring. However, gardeners who are inexperienced in how to grow chocolate cosmos may overlook what seem to be small, messy tangles of miniature dahlia leaves, unaware that once established, prolific blossoms nearly conceal the foliage. 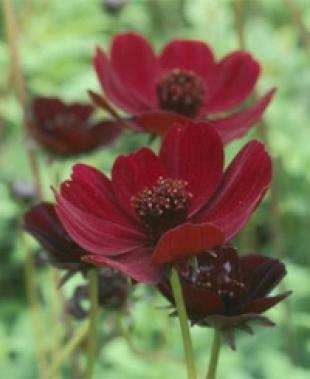 Once in bloom, chocolate cosmos blossoms continuously throughout the summer into the first frosts of autumn. 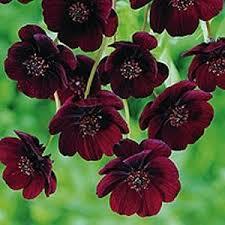 If you’re planning a gothic garden, chocolate cosmos is the plant for you. Sometimes referred to as black cosmos, dark maroon blossoms are so deep in color that they appear brown/black in late afternoon and evening. A native of Mexico, the chocolate cosmos is a half-hardy perennial and a sun loving plant that is moderately drought tolerant. 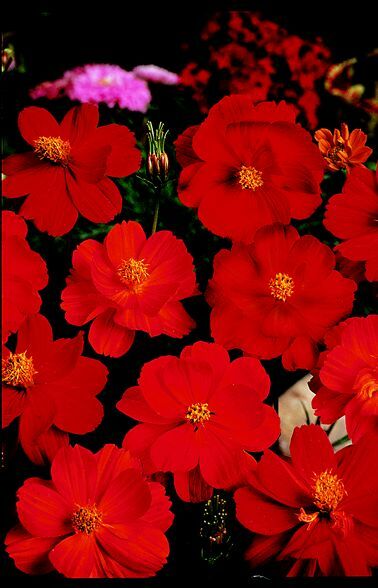 You’ll most easily grow chocolate cosmos from transplants purchased at your local garden center or nursery. Large clumps of established plants can also be divided to provide as many as three or four transplants. 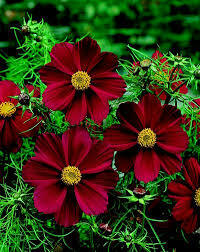 Plant chocolate cosmos in organically rich, well-drained soil in a location that gets full sun. Keep the transplants moist until they established roots and you see the beginnings of some new growth. In the fall, when foliage dies back, cut plants back to about two inches from the root and over-winter them in a frost-free area. Chocolate cosmos is hardy in zones 7-10. In these zones, you may opt to cover the plants with a cloche to protect them from danger of frost. You are free to publish the above article in your ezine or website, provided credit in the form of an (HTML clickable) hyperlink is given to the author.